← Breaking news: Bolivia offers Cañahua as the new Quinoa! The crime of drug trafficking is one of the scourges that has stigmatized Bolivian society for decades. This Government is no exception in the sense that it has faced large seizures of cocaine and growing violence associated with drug-related crimes and related offenses. From time to time, moreover, this government has had to face the shame that some middle official, or familiar of some notorious masista, has been discovered in cocaine trafficking. The first case to be remembered is that of Juana and Elba Terán, sisters of Margarita Terán, who were arrested with 146 kilograms of cocaine in 2008 and released after 99 days of being detained, paying a bail of 150,000 Bolivians. Margarita Terán is a leader of Chapare and, in the last year, reappeared close to President Evo Morales in public events. 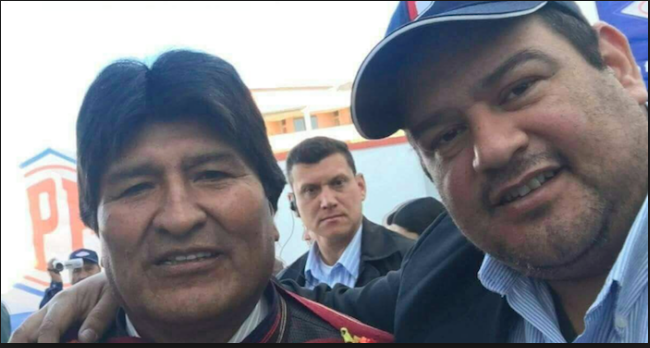 In 2010, Valetín Mejillones, the amauta who anointed Evo Morales as President in an indigenous act in Tiwanacu, fell with 240 kilograms of cocaine. In 2011, the US DEA detained retired Gen. René Sanabria in Panama, who was a commander of the Special Force against Drug Trafficking (FELCN), and when he was arrested, he was director of the Intelligence and Information Generation Center of the Ministry of government. He was accused of preparing a shipment of cocaine from Bolivia to the United States and of having already introduced in Miami 144 kilos of drug. It was the biggest blow and the biggest shame of the current Government in terms of drug trafficking. Sanabria is now serving a sentence in a United States jail. From then until 2017, the government did not have any major upheavals, until in July 2017 a scandal broke out in Brazil, where citizen Rómer Gutiérrez Quezada was arrested with 100 kilograms of cocaine. It is not about any citizen. Gutiérrez is the brother of the deputy deputy of the MAS, Amparo Gutiérrez, and was an adviser to the councilor of Santa Cruz Melody Téllez. Hence it became known as narcoesor. But the headache for the government was just beginning, as social networks were gradually filled with photographs of Gutiérrez posing or delivering campaign materials along with high-ranking dignitaries, including President Evo Morales himself. Taking a photo is not a crime, said the aforementioned, however, some, as seen in the images, also gave them campaign materials. The issue was barely forgotten by the media, when in September the narco-brother case of Deputy Adriana Arias broke out, who are in the Palmasola jail for drug trafficking. The issue came to light because the opposition congressman Tomás Monasterios publicly denounced that Máxima Arias benefited from a private audience in a hospital and that, despite the drug was in the house of Juana Arias (another sister), was not seized. The woman was found with 10 kilograms of cocaine. Only then did it become known that a year earlier, Fermín Arias, another brother of the deputy, had been arrested with 20 kilos of cocaine and sent to Palmasola. Although the crimes are personal, attention is drawn to the ever closer ties with senior masista positions. And on the other hand, it is not surprising that these cases, particularly that of the Arias brothers, did not deserve even the slightest indication of indignation or repudiation on the part of the ruling authorities. On the contrary, it seems that they were waiting for the mini-scandal to go away that some opponents and few media do, so they do not to have to go through the uncomfortable situation of having to refer to the subject. If this government does not want to end up stigmatized by drug trafficking, it should put more emphasis on investigations regarding the ties of its officials who have family members involved in drug trafficking. The picture I inserted above shows the familiarity of that embrace … to Mr President! …? … that hand on this boulder of the cocalero caudillo, in Latin American “language” shows who is the real leader … the Patron? That is why this petty egomaniac needs to finish his term and let us rebuild our Nation! This entry was posted in Bolivia, Crime and Violence, Drug war - narcotraffick, Economics, Environment, Health, Politics, Social Unrest and tagged cocaine production, corruption in public office, government failures, police and judicial corruption. Bookmark the permalink.